Uthman Wahaab was born in Ilorin, Kwara State, Nigeria in 1983 and grew up in Lagos, Nigeria. He holds a higher diploma degree in Fine Art from the School of Art, Design and Printing, Yaba College of Technology, Lagos. Uthman is a multi-disciplinary artist whose media include painting, graphics design, film, photography, sculpture and installation. His foremost concern is developing a new visual language that consciously rejects traditional form of depiction and begins to document the ongoing history and unfolding reality. 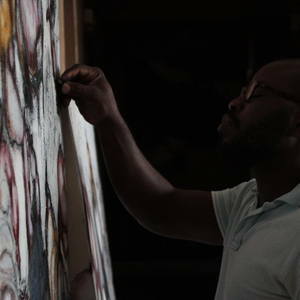 His work currently focuses on the issues of identity, beauty, sexuality and cultural influences that inform technological change and social shifts in Africa. Uthman is also interested in politics of religion, cultural traditions and social differences, particularly within the context of Africa. Wahab is currently represented by Sapar Contemporary in New York City. studied painting in the school of art,design and printing. yaba college of technology, Lagos Nigeria. TAFETA & Idaro arts, St Tropez, France August 2016. TAFETA & Idaro arts, Vic-en Bigorre, June France 2016. August 30th - September 27th, 2015. 5, Military Street, Onikan Lagos, Nigeria. 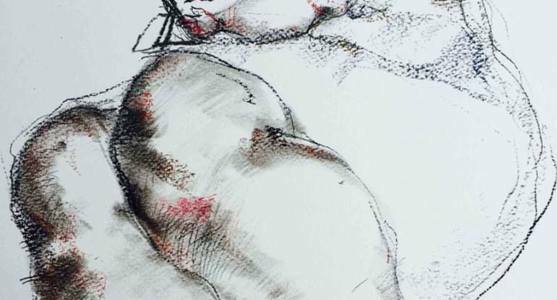 An exhibition of drawings that aims to deconstructs the concept of how drawings can interact with the gallery space. The drawings are in rhythm and movement, travelling seamlessly from the drawing surface of canvas and paper, to the walls of the gallery and finally into digital spaces via Samsung tablet devices with the collarboration of samsung mobile Nigeria. by the powerful visual artist duo of Soji Adesina and Uthman Wahaab. A body of works by artists Uthman Wahaab and Adesoji Adesina that raises rhetorical questions around narratives on identity and representation. It addresses the supposedly inability of Africans to apply themselves to the mechanism that enables modernization through the application of the laws of economics, science and technology. Opening: Thursday 25th September. 7 pm - 9 pm. veiwing: Thursday 25th September _ 10 October 2014. 107, Awolowo Road Ikoyi Lagos. Summer Series, Art Tafeta London, 2017. The Drawing series, Sapar Contemporary Newyork 2017. ArtX live , ArtX Lagos Art Fair, Lagos 2016. NDIDI DIKE, FATAI ADEWALE AND OMA CYRIL. 31ST OF MARCH TILL 30TH OF APRIL, 2012.